Baton Rouge, LA (August 9, 2018) – The Louisiana Department of Agriculture and Forestry (LDAF) has launched an online portal to help Louisiana businesses apply to the Certified Louisiana logo program online. 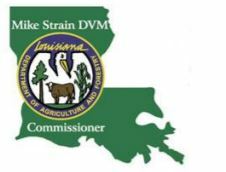 “This is one more way we are making it easier for people to apply for and renew their Certified Louisiana, Certified Cajun, Certified Creole, and Certified Farm to Table logos for their products,” said LDAF Commissioner Mike Strain, D.V.M. While paper applications are still available, this online resource makes it easier and faster for the department to determine whether an agricultural product or agritourism activity is eligible to be labeled with a certified logo. The new, user-friendly online portal can be accessed from a desktop, tablet or smartphone. to promote their products to consumers as authentic Louisiana products,” added Strain. Certified Louisiana logos were established to promote Louisiana made, grown, manufactured or processed products and aimed at enhancing and promoting Louisiana’s agricultural industry. The Certified Louisiana program was revamped earlier this year and strengthened its eligibility requirements. The LDAF determines eligibility. To become certified, a company must be in compliance with applicable state and federal permits, licenses and laws. There is a $25 non-refundable application fee. If approved, there is a $30 registration fee per logo. All logos must be renewed every three years. To learn more about the LDAF Certified Logo program or apply for a logo visit, go to www.ldaf.la.gov and click on the certified logo link or go to https://certifiedlouisiana.org/.